All operators, regardless of vessel type, size, location or function, are plagued by the same worries: “When will my next outage happen, and what is it going to cost me?” In an effort to ease these concerns, millions of dollars are invested every year into commercial/workboat maintenance programs. But how can maintenance be maximized without blowing budgets? What’s the most thorough way to monitor equipment? How can all mechanical components be watched for possible issues and failures? 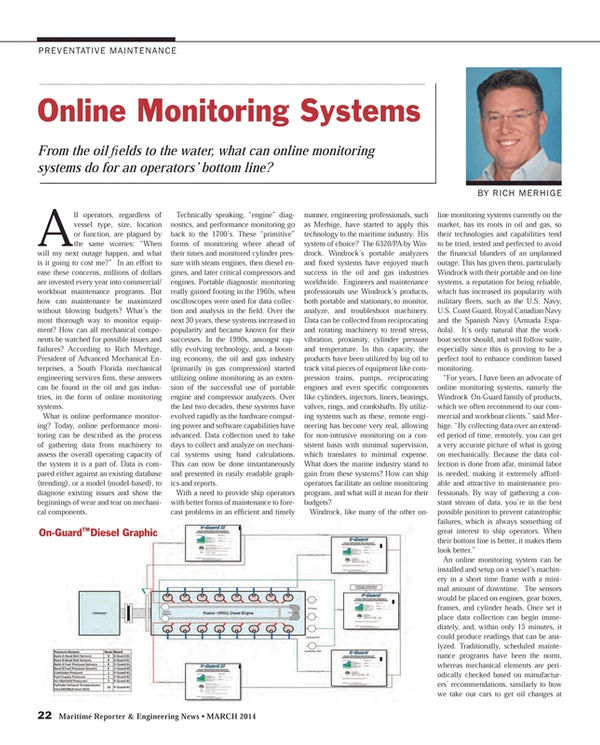 According to Rich Merhige, President of Advanced Mechanical Enterprises, a South Florida mechanical engineering services firm, these answers can be found in the oil and gas industries, in the form of online monitoring systems. What is online performance monitoring? Today, online performance monitoring can be described as the process of gathering data from machinery to assess the overall operating capacity of the system it is a part of. Data is compared either against an existing database (trending), or a model (model-based), to diagnose existing issues and show the beginnings of wear and tear on mechanical components. Technically speaking, “engine” diagnostics, and performance monitoring go back to the 1700s. These “primitive” forms of monitoring where ahead of their times and monitored cylinder pressure with steam engines, then diesel engines, and later critical compressors and engines. Portable diagnostic monitoring really gained footing in the 1960s, when oscilloscopes were used for data collection and analysis in the field. Over the next 30 years, these systems increased in popularity and became known for their successes. In the 1990s, amongst rapidly evolving technology, and, a booming economy, the oil and gas industry (primarily in gas compression) started utilizing online monitoring as an extension of the successful use of portable engine and compressor analyzers. Over the last two decades, these systems have evolved rapidly as the hardware computing power and software capabilities have advanced. Data collection used to take days to collect and analyze on mechanical systems using hand calculations. This can now be done instantaneously and presented in easily readable graphics and reports. With a need to provide ship operators with better forms of maintenance to forecast problems in an efficient and timely manner, engineering professionals, such as Merhige, have started to apply this technology to the maritime industry. His system of choice? The 6320/PA by Windrock. Windrock’s portable analyzers and fixed systems have enjoyed much success in the oil and gas industries worldwide. Engineers and maintenance professionals use Windrock’s products, both portable and stationary, to monitor, analyze, and troubleshoot machinery. Data can be collected from reciprocating and rotating machinery to trend stress, vibration, proximity, cylinder pressure and temperature. In this capacity, the products have been utilized by big oil to track vital pieces of equipment like compression trains, pumps, reciprocating engines and even specific components like cylinders, injectors, liners, bearings, valves, rings, and crankshafts. By utilizing systems such as these, remote engineering has become very real, allowing for non-intrusive monitoring on a consistent basis with minimal supervision, which translates to minimal expense. What does the marine industry stand to gain from these systems? How can ship operators facilitate an online monitoring program, and what will it mean for their budgets? Windrock, like many of the other online monitoring systems currently on the market, has its roots in oil and gas, so their technologies and capabilities tend to be tried, tested and perfected to avoid the financial blunders of an unplanned outage. This has given them, particularly Windrock with their portable and on-line systems, a reputation for being reliable, which has increased its popularity with military fleets, such as the U.S. Navy, U.S. Coast Guard, Royal Canadian Navy and the Spanish Navy (Armada Española). It’s only natural that the workboat sector should, and will follow suite, especially since this is proving to be a perfect tool to enhance condition based monitoring. An online monitoring system can be installed and setup on a vessel’s machinery in a short time frame with a minimal amount of downtime. The sensors would be placed on engines, gear boxes, frames, and cylinder heads. Once set it place data collection can begin immediately, and, within only 15 minutes, it could produce readings that can be analyzed. Traditionally, scheduled maintenance programs have been the norm, whereas mechanical elements are periodically checked based on manufacturers’ recommendations, similarly to how we take our cars to get oil changes at recommended intervals. With the newer technology emerging, such as these online performance monitoring systems, traditional methods of maintenance are being replaced by predictive maintenance programs, thereby reducing budgets tremendously. According to the Electrical Power Research institute scheduled maintenance programs cost about $24 per horsepower. Another option typically employed, but not recommended, corrective/reactive maintenance, which comes in averaging $17 per horsepower. This, however, doesn’t put a price tag on the other factors involved in this scenario, like downtime costs, and stress. When a predictive maintenance program is in place, such as condition monitoring by online systems, you can reduce your costs to around $9 per horsepower, which is a huge savings. Another reason why engineers love these systems is because they’ve been designed to reduce maintenance schedules by about 20,000 hours. With reduced hours, minimal downtime, and non-invasive monitoring, budgets remain just as healthy as equipment. What online monitoring boils down to is working smarter, rather than harder. And, as this technology is quickly and continuously evolving, “smarter” is only going to get easier and more economical for operators. Rich Merhige has over 31 years of condition monitoring experience. He founded/is President of AME, which is recognized as an external specialist for condition monitoring by ABS. Teresa Drugatz joined AME in 2010 as Office/Marketing Manager. She holds a bachelor of science in communication from the University of Miami.